The Biblical King Solomon built the great wealth of his kingdom by making connections with other rulers and lands in the region. Monarchs such as the Queen of Sheba came to his court, and he traded with distant kingdoms for materials to build his massive temple. 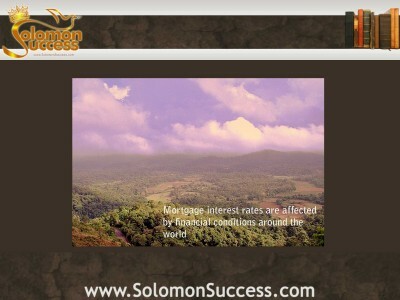 Events and people far away had an effect on Solomon’s kingdom. And in today’s world, conditions half a world away have the power to affect whether or not an individual can buy a home. It’s no secret that for much of 2012 interest rates for 15 and 30-year fixed-rate mortgages have been running at or near record lows. The same is true for other kinds of mortgage products including introductory rates for adjusted rate mortgages, or ARMs. These rates come in the midst of a modest housing recovery which has seen home prices stabilize, fewer houses going into foreclosure, and more new home starts. In general, mortgage rates are influenced by a number of factors, both at home and abroad. Although conditions in the US economy as a whole might seem to be a major factor in influencing trends in mortgage rates, financial experts say that, unless economic indicators take a significant leap upward, moderate economic growth may not make a significant impact on interest rates – at least not enough to drive them to the current lows. Economists and financial experts look to other factors. In the aftermath of the housing crisis of a few years ago, which saw a record number of foreclosures and mortgage defaults, the Federal Reserve took several steps to bring mortgage interest down. One option was to purchase long-term securities and sell off short-term debts. Another involved taking on large numbers of foreclosed homes, or those nearing foreclosure, through the federal lending agencies Freddie Mac and Fannie Mae. Conditions abroad also affect mortgage rates in some significant ways. An example is Europe’s financial instability and worries about the fate of the euro. Economic conditions in individual countries such as Spain and Greece may also add to global instability and drive more investors to move money to safe havens in other areas. This shift in funds from one market to another in turn pushes down the yields on Treasury notes. Because the secondary mortgage market relies on yields from the 10-year Treasury note as a benchmark for setting 20-year fixed-rate interest rates, factors affecting the status of these Treasury bills will then push interest rates up or down.